I was pretty hard on President Obama’s oil spill speech on Tuesday, and one reason was his unwillingness to use the occasion to press for a serious climate policy. It’s true, as Dave Roberts points out, that Obama talked about raising efficiency standards, investing in clean energy tech, and setting renewable energy standards, all of which are important things. But he very deliberately didn’t mention climate change, didn’t mention cap-and-trade, and didn’t mention carbon pricing even in passing. He just punted. Would talking about a carbon policy have made any immediate difference? Probably not. The politics of the energy bill currently in Congress look pretty dismal right now, and no amount of presidential oratory is likely to change that. Still, changing public opinion takes time and repetition, and when you have a big audience primed to hear about energy policy, it’s foolish to let the chance pass without even giving it a mention. But there’s another reason it was disappointing that Obama didn’t mention carbon pricing: his own EPA had handed him a perfect excuse just one day before. In a detailed analysis of John Kerry’s American Power Act, the EPA provided estimates of how it would affect carbon emissions and how much it would cost the average American. The results were remarkably reassuring. On the emissions front, the APA would have a dramatic effect: US emissions would be cut nearly in half by 2030 compared to doing nothing. That’s an enormous impact. But how much would it cost? The answer is: almost nothing. According to EPA’s models, if we do nothing, consumption of goods and services in the United States will increase 74.1% by 2030. 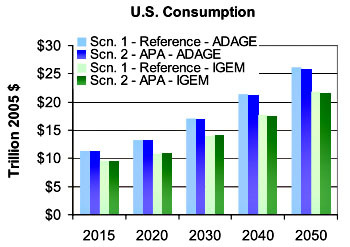 If APA is passed, consumption will increase 73.4%. That’s it. We can cut carbon emissions nearly in half, and the net cost will be a decrease in consumption of 0.7% in 2030. EPA figures this comes to an average annual cost of $146 per household. That’s 40 cents a day per family. A prime time address was the perfect time to plant this seed with the American public, to let them know that we can address climate change at a distinctly non-scary cost. But that chance slipped away unused. It was a wasted opportunity.